All around the world, brides­-to­-be, dream of a Tahiti honeymoon! Over the years, painters, writers and film makers, shared their love for these inspiring islands. The legends grew, until a honeymoon in Tahiti became the ultimate romantic destination for newly­weds to celebrate their precious connection. We agree that Tahiti provides a blissful setting for couples to delight in their first holiday together as husband and wife. Lush, green islands surrounded by calm, turquoise lagoons; secluded white sand beaches; luxurious resorts; and a touch of French sophistication; all contribute to making Tahiti a symbol of romance. There are many factors to think of when planning your perfect honeymoon. Tahiti has so many beautiful islands! Which gorgeous resort do you choose? How do you get around the islands? This distant land is a mysterious, unknown place. Which is part of it's appeal. Which Islands to visit on your Tahiti Honeymoon? Couples having a honeymoon in Tahiti have a smorgasbord of gorgeous islands to choose between. 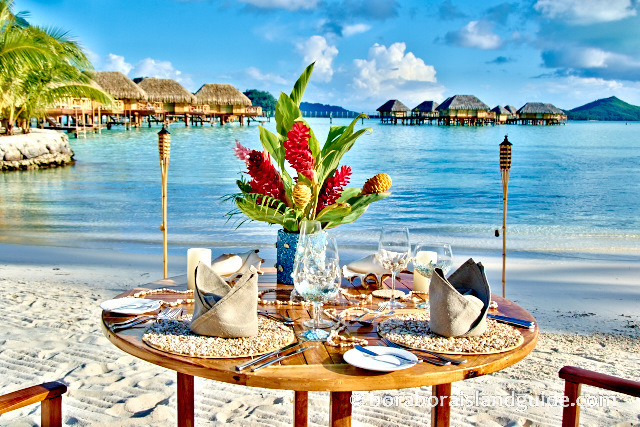 The islands most visited by honeymooners are Tahiti, Moorea, Bora Bora, and Tahaa. The most popular honeymoon island in Tahiti is (no surprise for us here at Island Guide) is the most beautiful island...BORA BORA! See what makes a Bora Bora honeymoon so special. Finding out more about each Tahitian island will help you to decide your honeymoon location? Here are the most popular honeymoon islands, with the most luxurious Tahiti resorts. There's a variety of Tahiti honeymoon packages available. You can choose by destination, activities or special interests. Honeymooners can select from many available 'ready-­to­-go' packages. Some websites even let you tailor your own package on-line with all their available 'add­-ons'. Here is an example Tahiti vacation package. Or you can collaborate with a specialist Tahiti travel agent to create your own custom designed honeymoon. By choosing one that also offers support, during your honeymoon vacation, you have the assurance that every detail will be taken care of. Have you thought of a Destination Wedding? 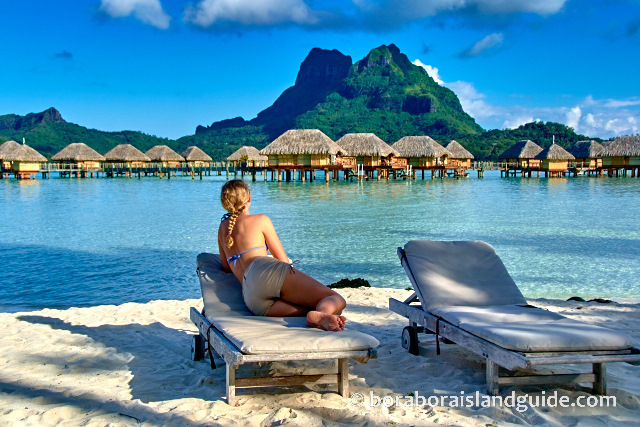 Tahiti and Her Islands always feature in 'top 10' lists of honeymoon destinations in the world. The resorts in French Polynesia, especially the Bora Bora luxury resorts, are practiced at providing the most romantic honeymoons on earth. They are also masters at creating blissful destination weddings. Get married in Tahiti, and after the guests go home, you continue with your honeymoon in paradise. Tahiti honeymoons provide a perfect adults' playground for enjoying memorable first days together as husband and wife. You can relax under a palm tree on secluded, white­-sand beaches; loll in the warm lagoon under the tropical sun; and have a white tablecloth dinner­-for­-two, right on the beach. Yes, a honeymoon in Tahiti sets the mood for romance and intimacy. When you are ready to get out and explore the island, there's a diversity of activities to choose from. Visit a black pearl farm and choose the perfect honeymoon souvenir - a precious Tahitian pearl! The list goes on. Find out all the activities and excursions that are available. In the evening you can relax on the deck of your over water bungalow with a cocktail, and watch the sun setting over the horizon, as you kiss the one you love. Honeymoons only happen once, so make yours a Tahiti honeymoon!